The idea was to break up the long hot summer by spending the weekend someplace cooler than Miami. Of course, our visit to Chicago coincided with a heatwave that brought 90 degree temperatures right along with us. So that part didn't go as planned. My last brief visit to Chicago focused mostly on high-end dining – Alinea (pictures here) and the now-closed L2O (pictures here), though I also managed to squeeze into a seat at Au Cheval (pictures here) and snag one of their awesome burgers. But this trip was planned on fairly short notice, too late to book seats at a couple other places high on my to-do list: Grace and 42 Grams in particular. So the question was, where to go in Chicago where we could book a table on about a week's notice? I aimed a bit lower and made reservations at a couple newer additions to Chicago's dining constellation – Salero and Momotaro – as well as a place I've been hoping to try for a couple years, Trenchermen. Other than the weather, it all worked out pretty well. Here's a brief travelogue of where we went and what we did. Our very first stop was at the Broken Shaker (see all my Broken Shaker pics here), a newly opened Chicago outpost of Miami's craft cocktail bar in the Freehand Hotel. I may have brought the Miami weather with me, but the Bar Lab boys, Elad Zvi and Gabriel Orta, seem to have brought all the rest of the Magic City to the Windy City. They've done an uncanny job of capturing the look and feel of the original bar in the old 1930's era Miami Beach Indian Creek Hotel. They get the drinks right too, with some Miami staples (Cocoa Puff Old Fashioned) mixed in with some Chicago-inspired cocktails. A Devonshire Fizz, with Rare Tea blood orange scented green tea, Campari, grapefruit soda, vermouth and Milagro tequila, took the edge off a steamy Chicago afternoon. We even ran into Elad at the bar, a day before he headed to New Orleans for Tales of the Cocktail and picked up a well-deserved award for Best American Hotel Bar for Shaker Miami. From there, we headed to dinner at Salero (see all my Salero pics here), a Spanish restaurant which opened about a year ago in the West Loop, which is becoming Chicago's restaurant row. The chef is Ashlee Aubin, an alumnus of (now-closed) Zealous and Alinea who also runs the kitchen at Wood. 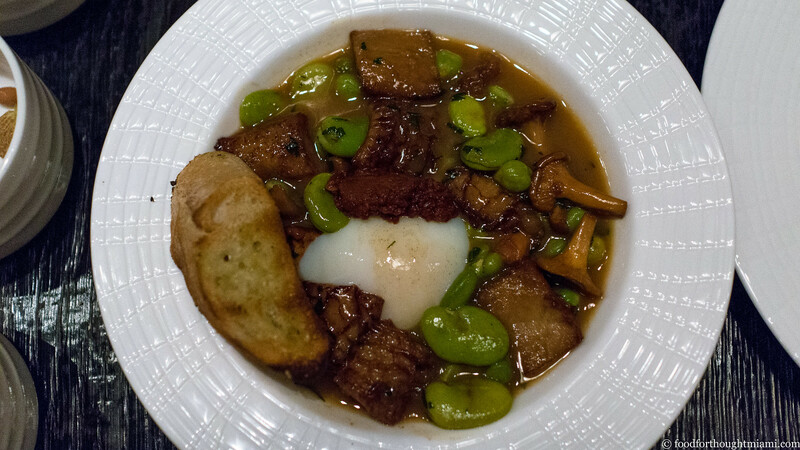 At Salero, Aubin mixes old and new, with lots of Basque influences in particular on display. 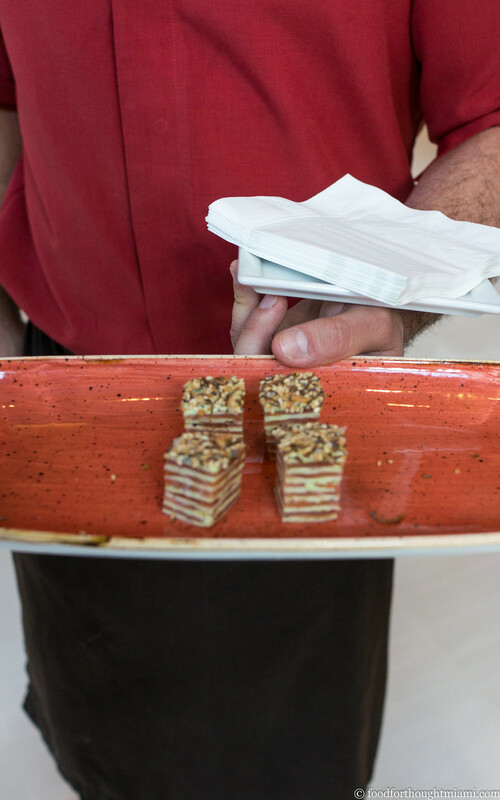 Though Spanish often means tapas, Salero's menu eschews the now-ubiquitous "small plates" format for more traditional appetizers ("entradas") and entrées ("platos fuertes"). Still, there is also a bar menu of pintxos (the Basque tapas equivalent) which, if you ask nicely, you can also avail yourself of in the dining room. 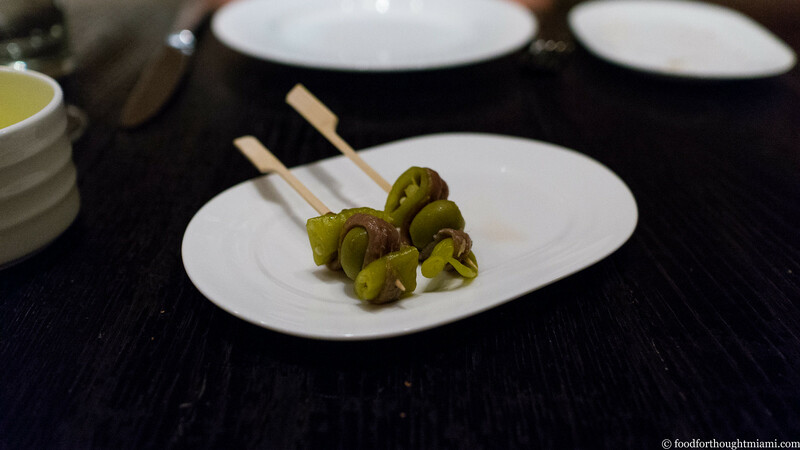 It was from there that we ordered a couple "Gildas," a simple and wonderful pintxo of anchovies, manzanilla olives and guindilla peppers found throughout San Sebastian and Bilbao. 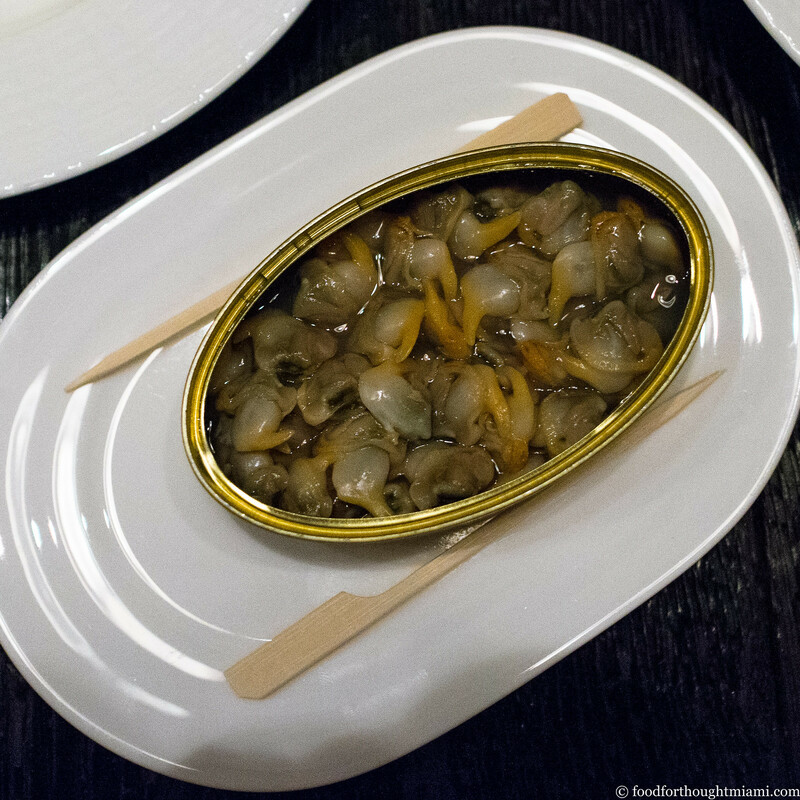 Also from the pintxos menu, a sampling of Spain's outstanding "conservas," or canned seafood products: berberechos (cockles), served simply with bread, butter and lemon, and still tasting like they were straight from the sea. A variation on calçots looked to the Catalan instead of the Basque country for inspiration; the brick-red, mildly spicy romesco sauce was right on target, but the grilled spring onions were all crispy greens and none of the tender, sweet whites that are the highlight of the traditional dish. A rabbit terrine looked somewhat sloppy and disheveled, but I would have ordered anything that came with the excellent cheese-stuffed, tempura-fried padron peppers that accompanied it. And I loved Salero's modernized version of callos a la madrileña, which was the Best Thing I Ate Last Week (last week). The following morning we headed up to Lincoln Park, where the Green City Market hosts a Saturday farmers market. 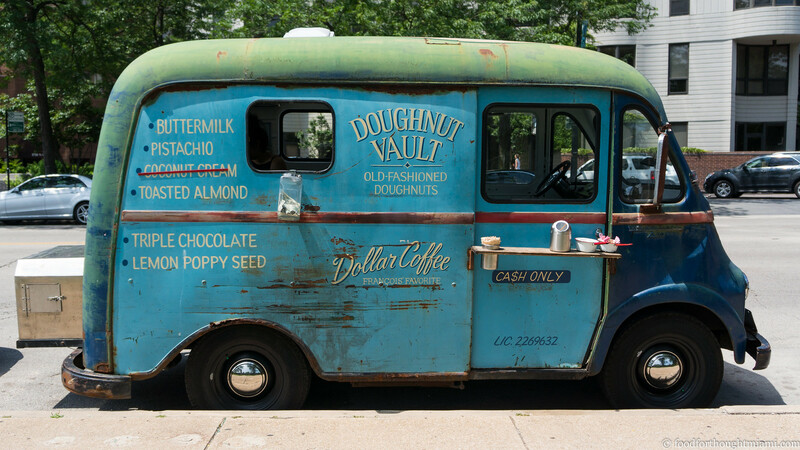 We grabbed a pint of some Michigan berries from Mick Klug Farm and a buttermilk doughnut from the Doughnut Vault truck parked along the street and had our breakfast on a park bench. 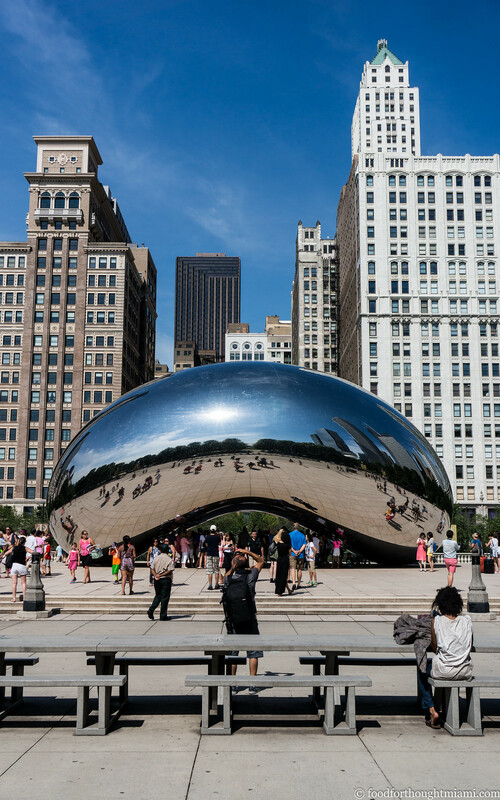 Just down the street is the Chicago History Museum, which had a fantastic exhibit of photos by Vivian Maier, a nanny for several Chicago families who in her spare time took pictures all around the city during the 1950's through 1970's. This was really a stunning exhibit with an odd backstory. Maier apparently didn't show her photographs to anyone during her lifetime, and at some point in her life, a storage locker with thousands of negatives was auctioned off after being seized by a landlord. 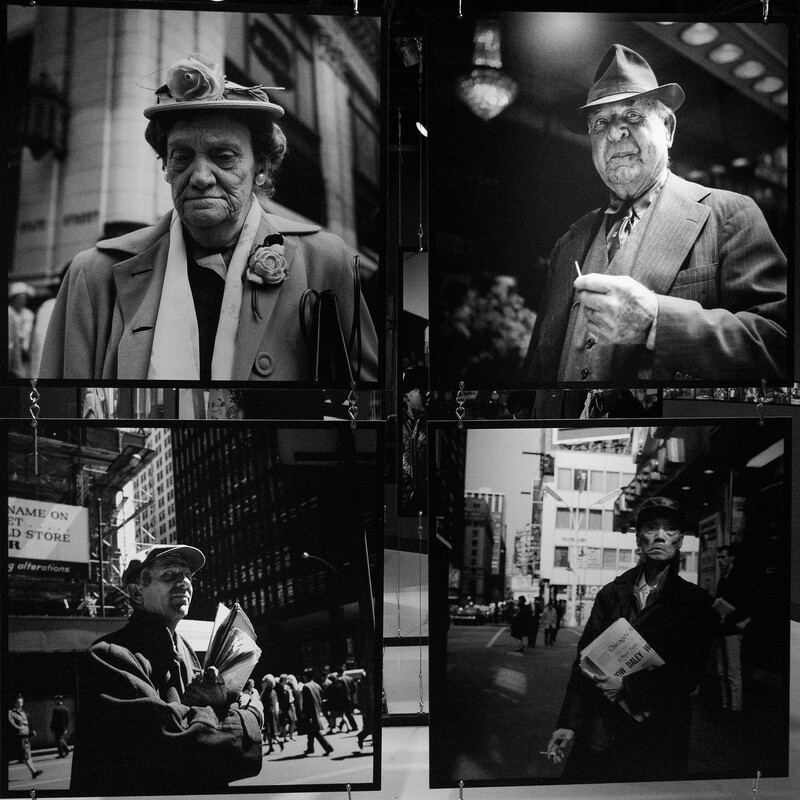 In 2007 the negatives were discovered in a thrift auction house and finally made their way to the public eye. We wound up back in the West Loop for lunch, and after poking our noses into Stephanie Izard's Little Goat Diner (one hour wait) and Au Cheval (three hour wait! ), I grabbed a sandwich at Cemitas Puebla instead. 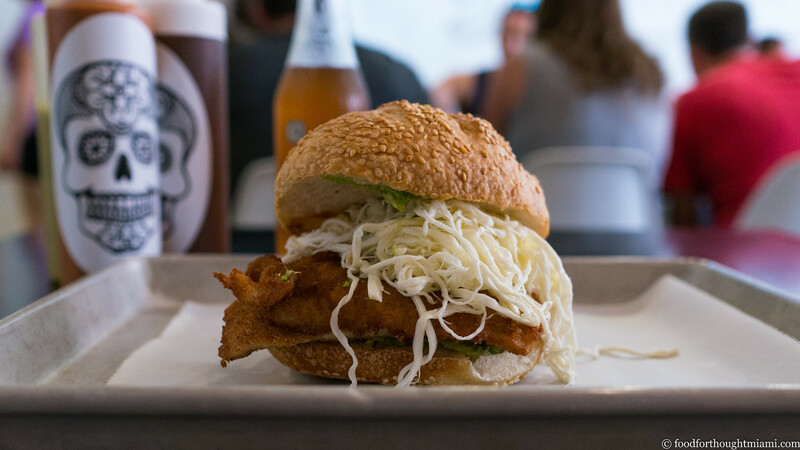 I'd never had a proper cemita before and my expectations were high – perhaps too high. I went with the milanesa, and it was a good, satisfying $8 lunch, but nothing that changed my life in any meaningful way. Nice crispy, juicy pork loin, on a nice puffy, crusty-shelled roll, but it had too much cheese, not enough avocado, and barely a whisper of any chipotle sauce. I doctored it with the tableside salsas, but it wasn't enough to make any magic. For dinner, we headed over to Wicker Park, past the teeming hordes filling the outdoor patio and stuffing their faces with tacos at Big Star, and around the corner to the somewhat more sedate Trenchermen (see all my Trenchermen pictures here). The entrance looks like a Victorian scientist's cabinet of curiosities, with terrariums mounted on the wall and shelves stuffed with odd knick-knacks. 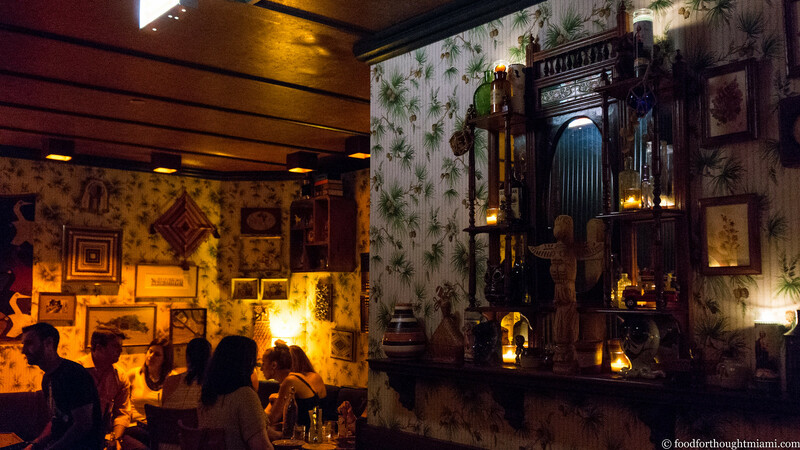 Down a half-flight of stairs, you'll find yourself in the lengthy bar, which occupies a space that used to be a Russian bathhouse and still feels a bit like it, with white subway tiles lining the walls of the subterranean space. The dining room occupies a parallel room dominated by huge octagonal lights that look like they were poached from a Frank Lloyd Wright project. The food, from Chef Pat Sheerin, is equally eccentric, often referencing multiple cuisines at once, even on the same plate. Notwithstanding the heartiness suggested by the restaurant's name, most dishes tread pretty lightly. The menu is divided into sections for cold and warm starters and then mains, but a four-course prix fixe option lets you choose two starters, a main and a dessert, which is about the right amount of food. Salt and pepper squid, served over a salad of cubed eggplant and cucumber with spicy chiles, felt Asian and Middle Eastern at the time, sichuan peppercorn bringing that tingly "ma la" sensation, cumin vinaigrette adding that warm B.O. funk. That may not be the most appetizing description, but it was a delicious dish. A plate of grilled carrots paired with English pea falafel balls and an orange and olive oil "jam" also tasted like it had blown through the Mediterranean on its way to the table. A salad of kale and pickled escabeche vegetables napped with an avocado goddess dressing and sprinkled with toasted pumpkin seeds felt appropriately virtuous. 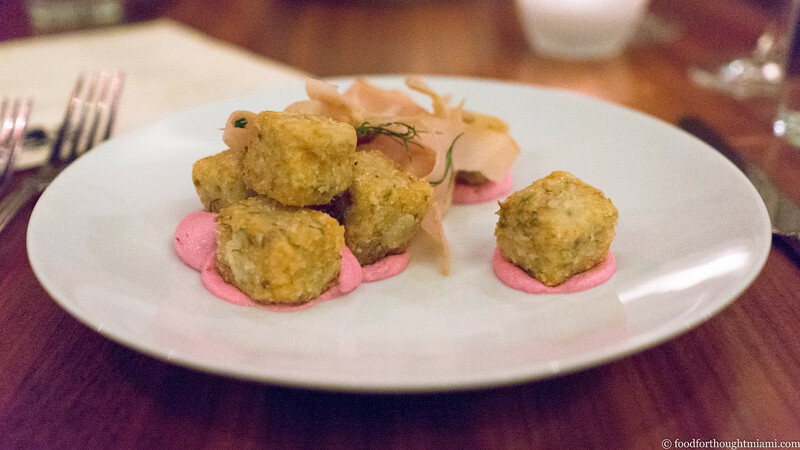 If Trenchermen has a signature dish, it may be the "pickle tots" – a mash-up of tater tots and fried pickles, served with a hot pink yogurt infused with dehydrated red onion, and ribbons of cured and smoked chicken "bresaola" (you can watch the Sheerin brothers prepare the dish here). I can see why they'd have trouble taking it off the menu – it's a great dish, simultaneously contemporary and nostalgic. 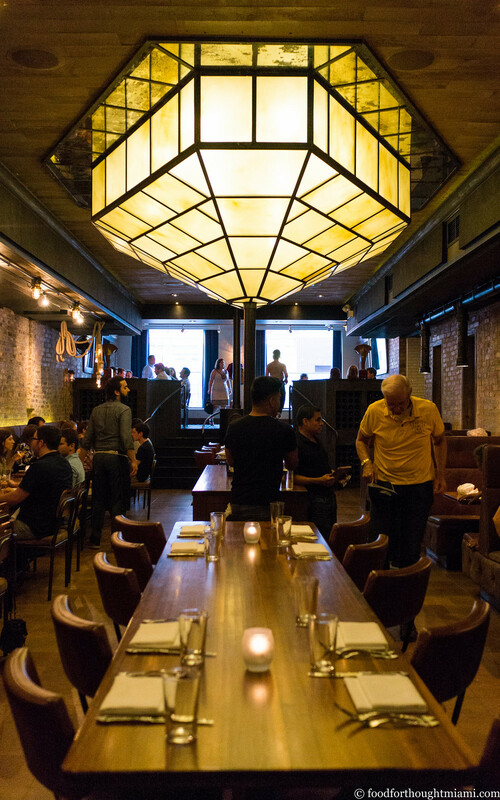 While you can go meaty at Trenchermen, with a double burger, beef shoulder, or leg of lamb, it's also a vegetarian-friendly place, with not one but two plant-based main course options. Wanting to eat light, we tried both. I preferred the toasted oats with mapo tofu, the tofu dusted with powdered chiles in a bowl rounded out with lentils, eggplant and toasted almonds. The roasted broccoli, with vadouvan spice, sprouted black chickpeas, a broccoli and hemp seed hummus and hoisin sauce, was not as good, the broccoli a bit woody and tough, the spicing a bit too mild-mannered. But the dessert – a Basque cake, served over an almond crumble and a smear of lemon curd, and crowned with a scoop of olive oil poppy seed ice cream – more than made up for it. I don't usually get that excited over cake, but this one, crusty on the outside and custardy within, was exciting stuff. It's Monday again already! And it feels like I just posted my "best thing i ate last week." (Of course, I was a day behind schedule last week, so maybe that explains it, or maybe I'm just not cut out to do weekly posts any more). 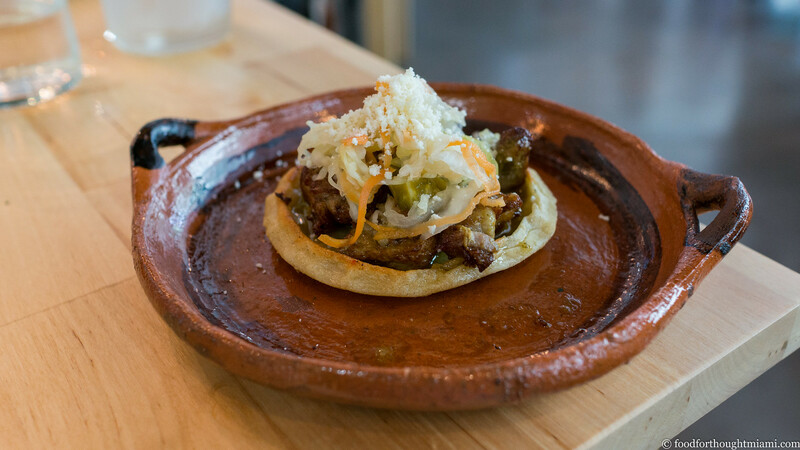 Lots of options this week, but if hard pressed to name the single best bite, it would be the gordita topped with griots and pikliz at Chef Richard Hales' newly opened Centro Taco, in the downtown Miami spot that formerly housed Sakaya Kitchen (not the original in Midtown, which is still open). This Mexican-Haitian mash-up was darn near perfect: a crisp, corn-y masa shell filled with tender, burnished-edged fried pork, a tangy, spicy cabbage slaw, a dollop of salsa verde and a sprinkling of cotija cheese. Before my first visit, I was by no means convinced that Miami needed another taco shop. But it can always use more like this. Runner-up: the beet sorghum risotto with horseradish and creme fraiche at Chef Michelle Bernstein's new Cena by Michy. Both the dining room at the original Michy's on Biscayne Boulevard, and the menu, have been updated, and this was one of my favorite new additions, like all the best things about borscht and risotto in one bowl. And it's wonderful having Michy back in the neighborhood. I'll likely have more thoughts on both of these places soon. Just a bit behind schedule here, as we only got back from a long weekend in Chicago yesterday. And yes, we did some good eating there, so competition was robust for "B.T.I.A.L.W." honors. But for me, there was also a clear standout. I am pretty much powerless when I see a tripe dish on a menu: I must order it. This is so even though I know that Mrs. F will not share it with me, having been burned once too often by my "I think you'll really like this one" pitches. (I have probably compromised our marital trust more by convincing her to try tripe dishes than if I told her I was concerned about the security of my Ashley Madison account). Callos a la madrileña is a classic Spanish stew of beef tripe in a tomato broth, typically bolstered with chickpeas, chorizo and morcilla sausages. And I was happy to see it on the menu at Salero, a new modern Spanish restaurant in Chicago from Chef Ashlee Aubin. 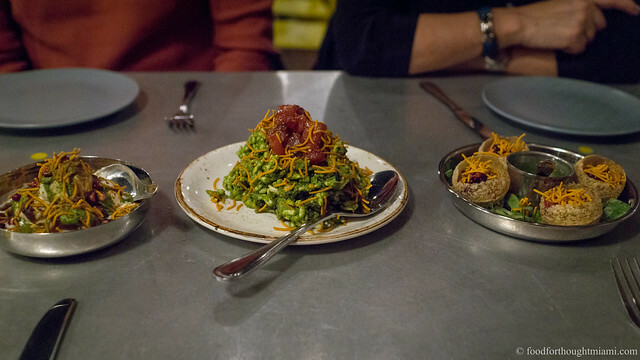 It's a tough thing to modernize such a dish while retaining its soul, but Salero pulls it off. The tripe is grilled, its honeycombed surface blackened with char. Fresh green fava beans substitute for the typical chickpeas. Plump chanterelle mushrooms are an unconventional addition which feel like they belong. There's spicy, soft 'nduja sausage where there would typically be chorizo. A soft poached duck egg adds yet another layer of gooey richness to that gelatinous, sticky broth. It was the best thing I ate last week (and I didn't have to share a single bite of it). (You can see all my pictures from the dinner in this Salero - Chicago flickr set). I know I seem like a homer when I pick dishes from our Cobaya dinners here. But the truth is we've been on a really nice streak lately. 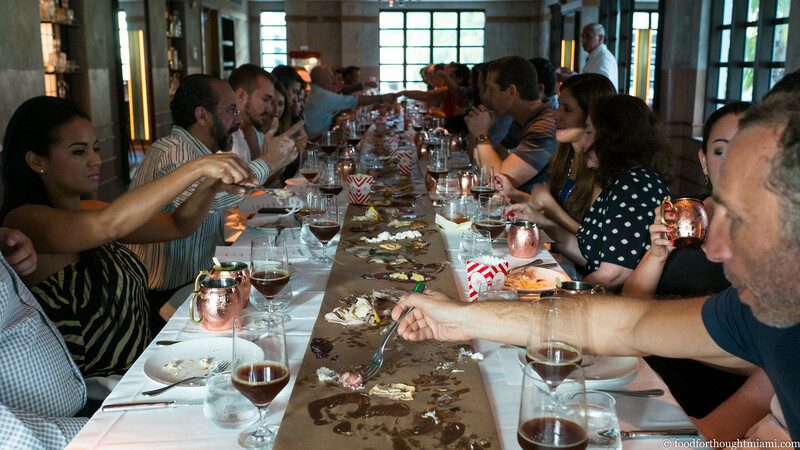 The trend continued in Experiment #55, with Chef Aaron Brooks from Edge Steak and Bar in the Four Seasons. 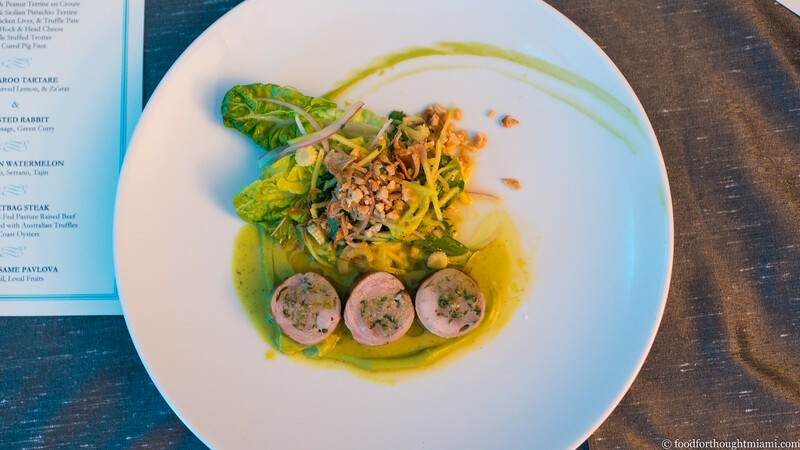 I could have easily gone with Chef Brooks' charcuterie plate, but we did that last week, so instead my choice for "best thing I ate last week" is this rabbit with green curry, the rabbit loin stuffed with a brightly flavored Thai sausage, the curry alive with lemongrass and makrut lime. You can read more about the dinner here. Runner up: the smoked oyster mushroom with Beemster gouda purée and crispy yuba skin from Chef Brad Kilgore at Alter. What an incredible umami payload in a vegetarian dish. In nearly six years, we've now done fifty five of these Cobaya dinners. I've missed two. One of them was Experiment #25 with Chef Aaron Brooks of Edge Steak and Bar, almost exactly three years ago. I was particularly disappointed to miss it because Chef Brooks is precisely the kind of chef we had in mind when we starting putting on these events. 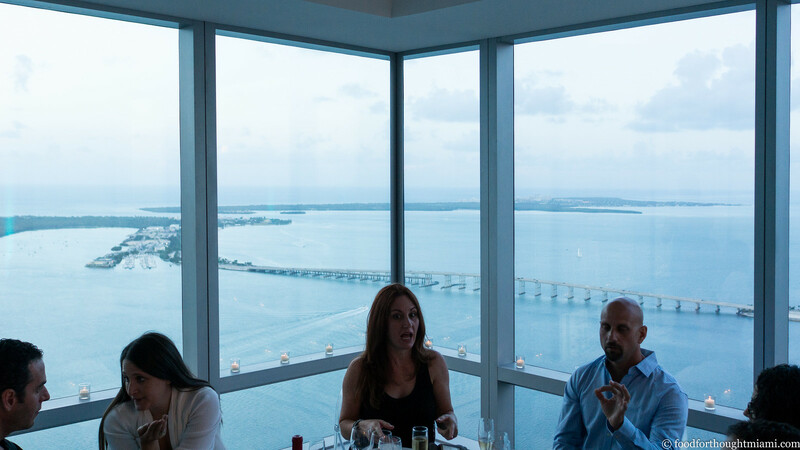 Edge is a very solid place – good enough that locals will regularly make their way to the seventh floor of a Four Seasons resort on Brickell to visit – but the restrictions of running a hotel steakhouse limit the range of what Brooks can do there. And his range is quite broad: he's an Australian native with an affinity for the flavors of Southeast Asia, which he put on full display in his last Cobaya dinner. He also has charcuterie skills that would rival anyone in South Florida, something you'd never know from a glance at the restaurant's menu. 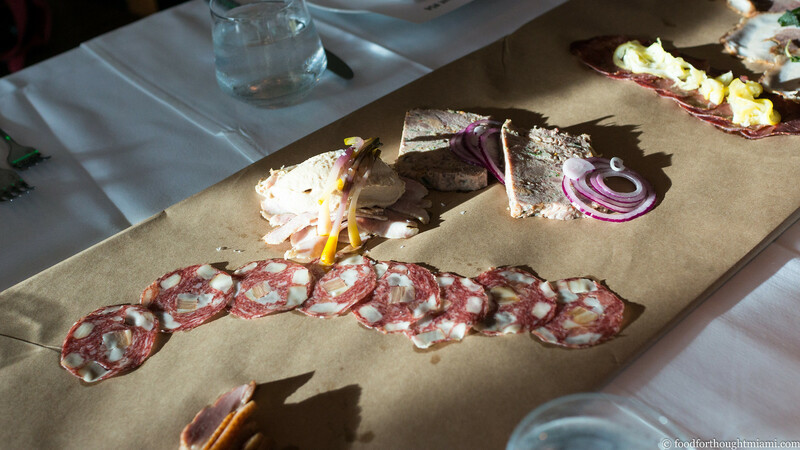 This time around, he kept things a bit closer to home, looking to the ingredients of his native continent for inspiration, and also put his charcuterie game on full display for us. (You can see all my pictures in this Cobaya #55 @ F65 with Chef Aaron Brooks flickr set). Experiment #55 started in the lobby of the Four Seasons, with flutes of champagne and a procession of little bites, some of which were enhanced by products from a soon-to-open tenant of the property: Caviar Russe. 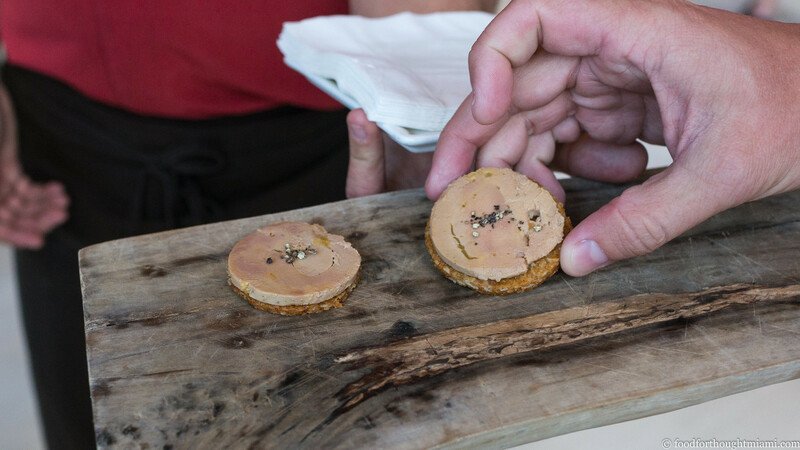 Anzac biscuits (the first hint of the Australian theme) topped with rounds of cured foie gras. Pork rillette grilled cheese sandwiches dolloped with caviar – an unlikely but delicious combination. Smoked salmon and ramp cream cheese layered between crepes and topped with everything spice. And at least one other that moved so fast I didn't get to taste it: toasts topped with morcilla and trout roe. Yet again, I miss out. From there, the Four Seasons team led us out the front of the lobby, around the side of the property, into the entrances of the Residences, and up the elevator to the 65th floor. 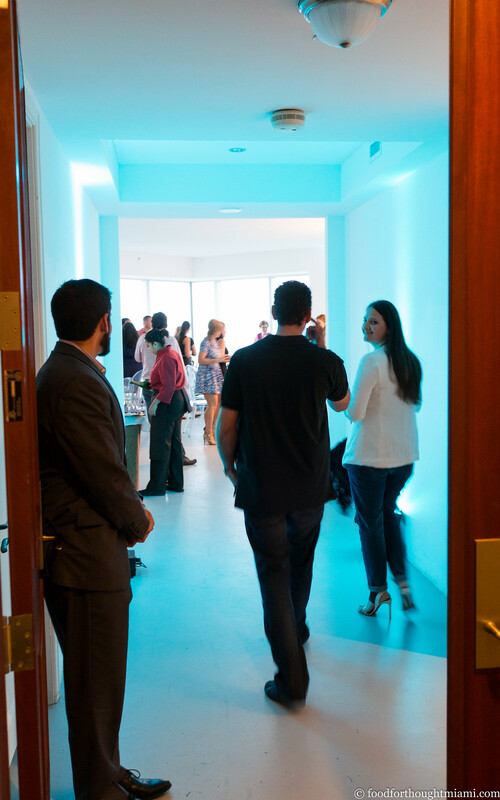 As we exited the elevator, we were welcomed into the open door of an empty condominium unit, with floor to ceiling windows on two sides looking out across the bay to Key Biscayne on one side, and down Brickell Avenue towards Coconut Grove on the other. Several round tables were set throughout the room; a DJ played in the corner. This was where we were to have our dinner. As Chef Brooks and his crew finished plating the first course in the condo kitchen, our guinea pigs sipped some more champagne and ogled the views. 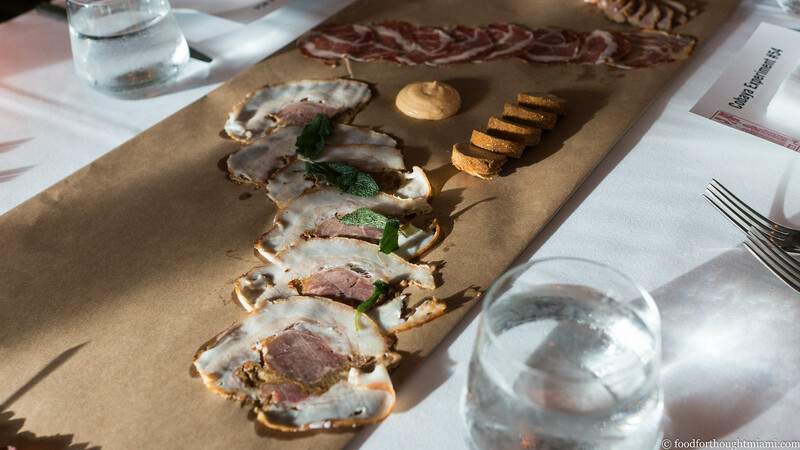 This inspired some ogling too: Chef Brooks' first round of charcuterie. Wow. What good stuff. 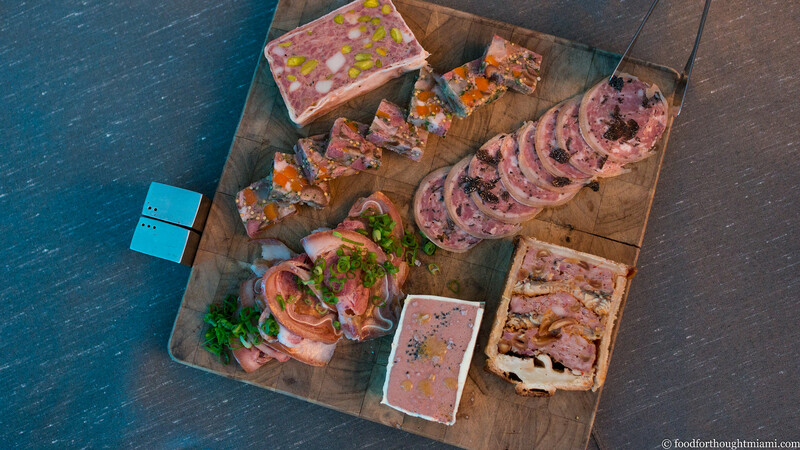 From top to bottom: duck heart and Sicilian pistachio terrine; smoked hock and head cheese; truffle stuffed trotter; soy cured pig's face; chicken, eel and peanut terrine en croute; and foie gras, chicken liver and truffle pâté, encased in truffle butter. Between this and the charcuterie spread at our last Cobaya dinner at Quality Meats, I'm thinking a charcuterie showdown may be in order. Edge's downtown neighbor, DB Bistro Moderne, would surely be invited, and maybe their cousin Café Boulud in Palm Beach would come down too. Maybe Miami Smokers? Who else wants in? The scent – well, let's be more blunt – ripe, animal funk of cured meats as we entered the room was a good sign. 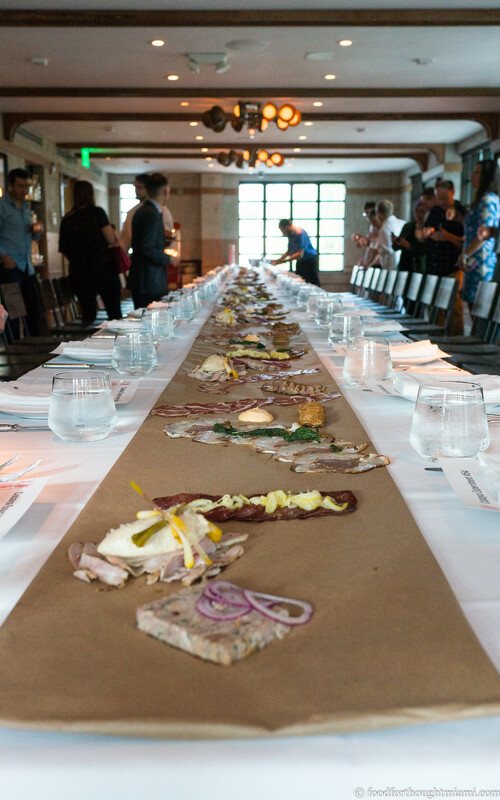 It soon became apparent from whence it came: a spread of charcuterie laid on top of butcher paper that stretched all the way down a table set for forty guests. We were in a private second-floor room in the old Bancroft Hotel on South Beach, a beautiful property whose Art Deco features have been pretty respectfully preserved. It's now the home of the Miami outpost of Quality Meats, a New York restaurant with some historical legacy itself: its owners opened the original Smith & Wollensky steakhouse in New York in 1977. The chef was Patrick Rebholz. Before joining QM, Rebholz had spent most of the past decade cooking in Charleston, most recently as the chef de cuisine at the Peninsula Grill. We got a hint that Chef Rebholz had big plans for his Cobaya dinner when he asked for an early start time. Sure enough, we didn't wrap up until nearly four hours after our 6:30pm commencement. It was time very happily spent. (You can see all my pictures from the dinner in this Quality Cobaya flickr set). After milling around at the bar while our group assembled, we were escorted upstairs to the "Bancroft Room" and its wafting meaty aromas. 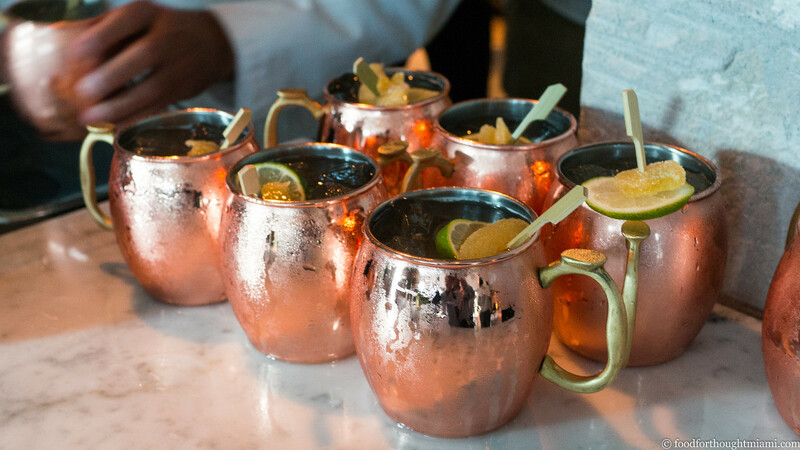 Moscow Mules in gleaming copper mugs were handed out to everyone. All the chairs were pushed back from the table so that Rebholz and crew could more easily make their way through to apply some finishing touches: cornbread cream on top of the smoked soppressata; aerated mozzarella on top of the coppa. There was plenty more: silky, intense cured foie gras torchon coated with malted barley and a mango gastrique; thin-sliced suckling pig coppa di testa and hearty headcheese; merguez "prosciutto" topped with preserved lemon; creamy calf liver mousse topped with pickled ramps; pork jowl pastrami; hickory smoked duck bacon; toasty pork jowl corn dogs with Tabasco mayo; popcorn dressed in dry-aged beef fat. 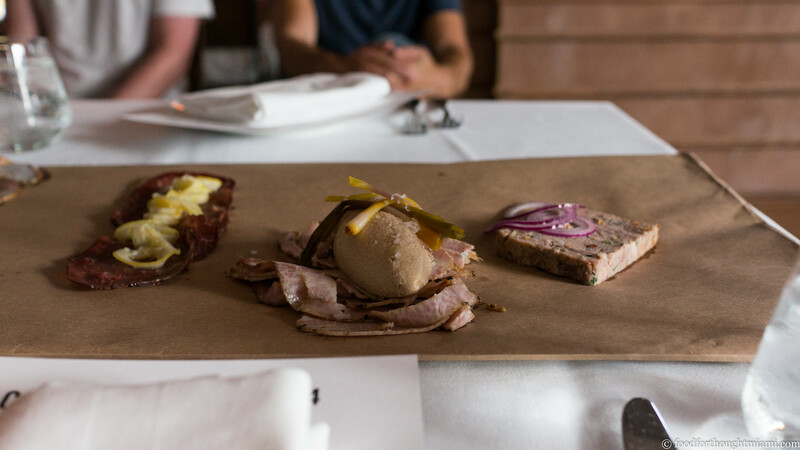 Rebholz poured some of his house-brewed beer too, and it was a great match with the charcuterie. It was a crazy good way to start a meal, and folks dug in pretty rapaciously. Then Chef Rebholz just rolled the paper down to clear the table.